Voice your opinion! Review Project Management Academy now. I am writing this review with mixed feelings for the company. I believe that the price I paid for the courses was a bit too much for the short duration of the couses. You are provided with materials for study that hopefully would be enough, however I do not believe that you are given very little time until the examination. The course itself seemed somewhat useful. The instructor that led the courses was slightly uninterested in the topic. Is Project Management Academy your company? 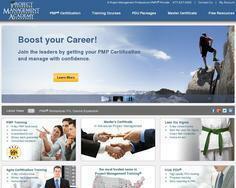 We offer the best PMP Training available. Earn your PMP Certification from the most trusted name in project management training. Money-back guaranteed.